Nurture a happy, healthy reader to support reading readiness. If your preschooler will head off to kindergarten this fall, you're probably starting to prepare for the transition. From school registration, to planning the change in family routine, there's a lot for parents to consider. One topic that parents are often concerned about in the year leading up to kindergarten is whether or not their child is ready. Does my child have the skills they need to succeed in school? Should they be able to read and write basic words? Should I be working with them using flashcards and workbooks? The short answer is no! Teachers hope that children will start kindergarten with some number and letter recognition, but drilling little ones on academics is not necessary. When you're out in public, point out familiar words to your child such as exit, stop, or thank you. Excursions to the grocery store present a wonderful opportunity to connect everyday words to objects, nurturing your child's understanding that words are symbols for real objects. Spot words commonly found around town and explain their meaning. Play a matching game with your child such as picture–word bingo. This will help your child understand that the letters in words must be written in the same order to carry meaning. 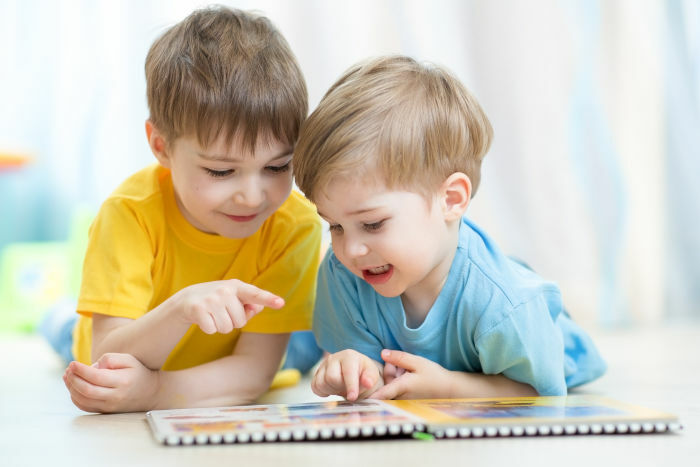 Dialogic reading is a technique where the adult becomes a listener, questioner, and audience for the child so that reading time becomes highly interactive. For example, as you read, use who, what, where, why prompts such as: Who is in the barn? What color is the caterpillar? Also, use open-ended prompts such as: Why is the boy happy? What is happening in this picture? What do you think might happen next? Encourage your child to put his thoughts down on paper, or try a white board and dry erase marker. Ask him to experiment with putting sounds together to make words. This way he can practice how sounds are represented by symbols (the alphabet letters). The Curious World Kindergarten Readiness Kit comes complete with a write-on white board and reusable letters for practicing spelling. A rich vocabulary and strong language skills are strong predictors of reading readiness. Help you child build these skills through oral language activities like rhyming games. Just pick a simple word that can be easily rhymed and ask your child to name as many words as she can think of that rhyme with it. This can be played anytime, anywhere. By providing a variety of everyday opportunities for children to practice emerging skills, you are helping prepare them for kindergarten, and laying a foundation for successful reading. Share with us on Facebook how your family is preparing for kindergarten reading.